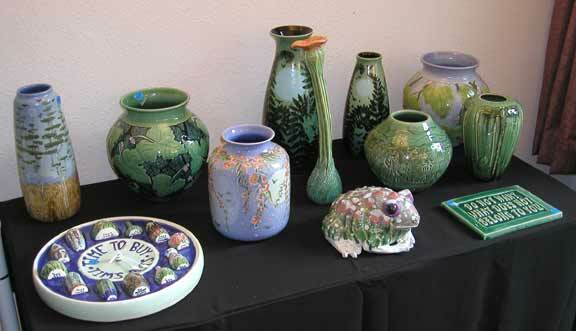 Here is a little bit of what is happening in Zanesville at Pottery Lovers. As usual, I didn't take as many pictures as I should have. There is a lot of partying, food, drink and good times. These pics are roughly chronological. 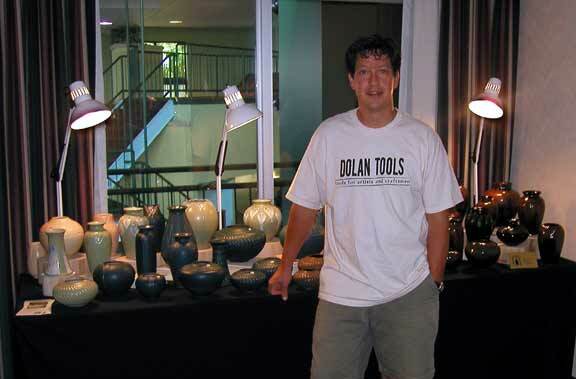 The first pic is of my buddy, Brad Lum, of Illumine Art Pottery and very supportative wife, Veronica. 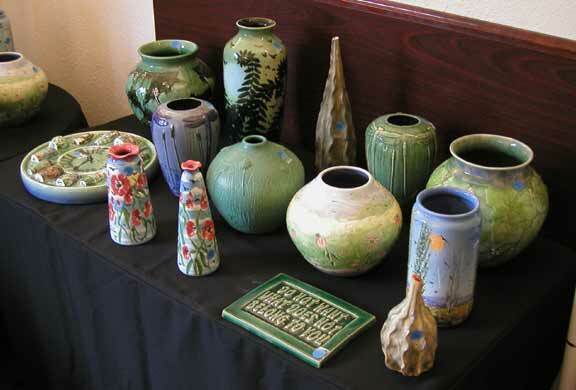 It is their first year at Pottery Lovers. Brad and I ran around visiting when we arrived. Here is Paul Katrich AKA the lustermeister. He is the luster glaze master. He set out a mere 14 pieces that disappeared as we turned our backs. Stopped by to introduce Brad to Allan Wunsch, AKA the former backbone of the AAPA. 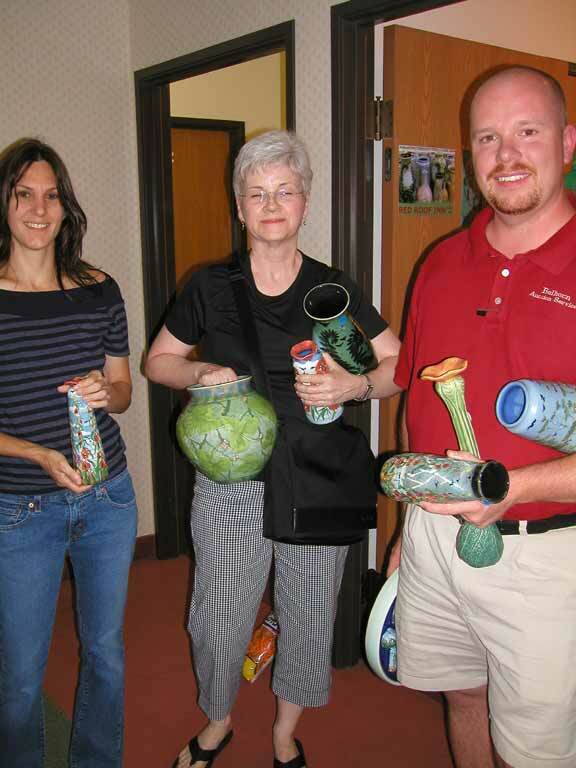 A group of us took a short plant tour of the Fioriware Pottery in downtown Zanesville. 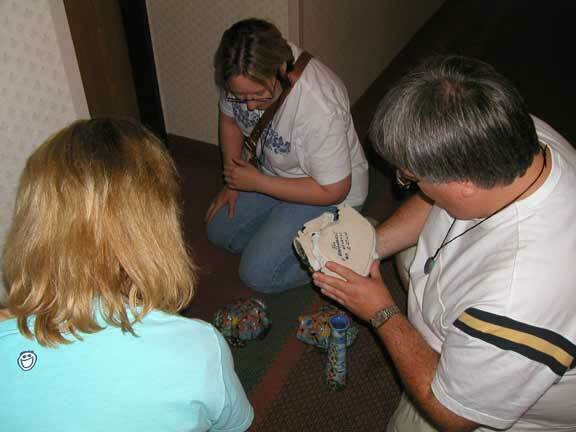 That is Kate Morgan in the blue, a potter from Alton, Illinois. 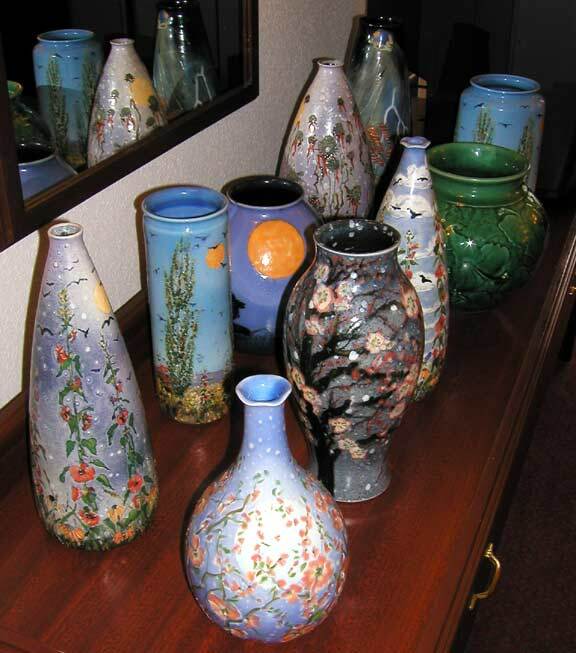 And she was with Art Towata a long time potter from Alton as well. More about those two later. Art knows how to get a lot for a buck. 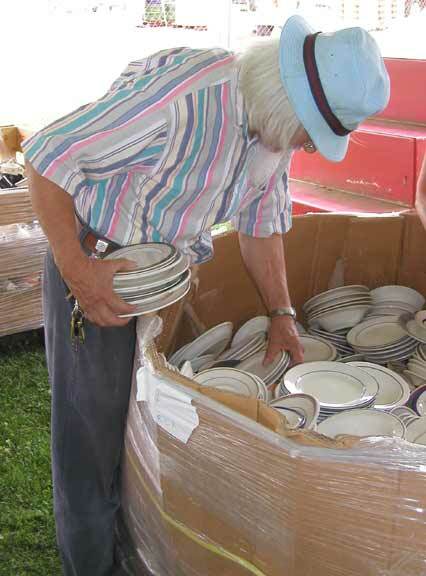 We went to the Roseville/Crooksville pottery festival and he found this huge box of dishes marked "10 cents each." He dove in. It is hard to keep his attention for very long, but that box sure did! 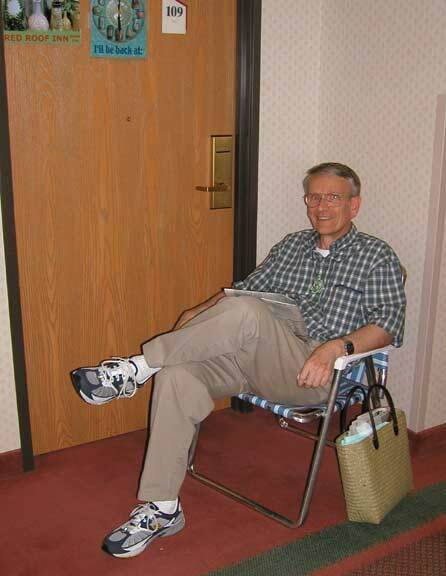 Once again this year, Tim J. Onstatt was first at my door nearly five hours before I opened it. I did reward him with a pot for the first person in line. A nice and personalized pot at that. Here are half a dozen shots of my room before opening. These folks are part of a conspiracy. 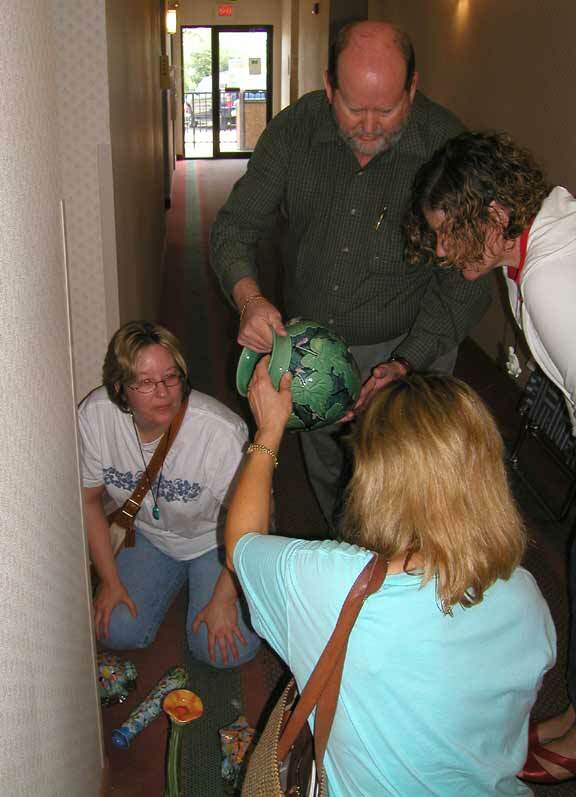 While sitting in the hallway for a few hours, they arranged a deal where they would all go in and grab what pots they ALL were interested then they came out in the hallway and divided them up. Notice that they got all three frogs. Who is going to get it? Terry!! 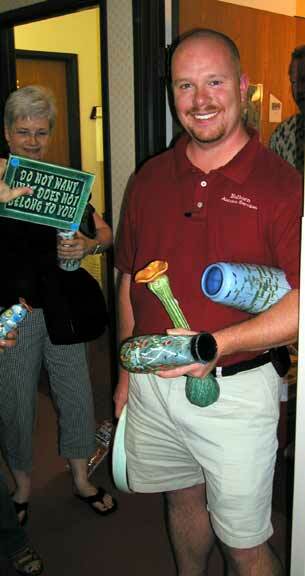 Tim, as you might expect, got a lot of nice pots. 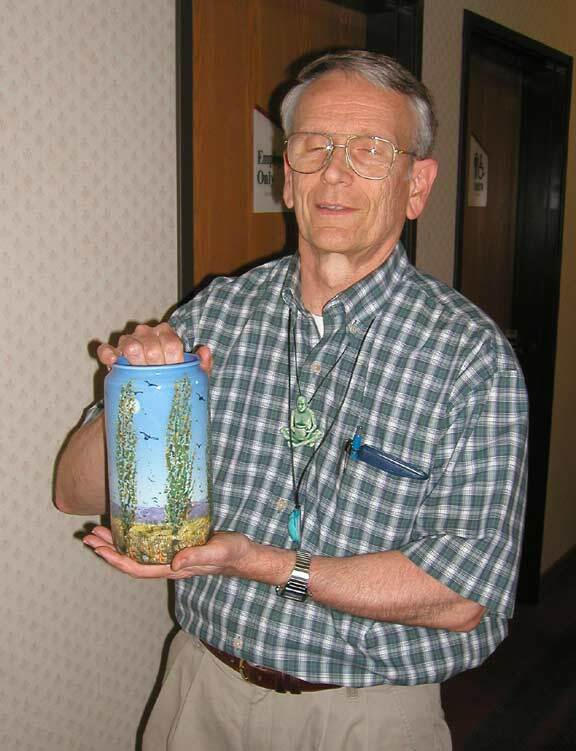 He is pictured here with one of the three Poplar Pots that I brought. 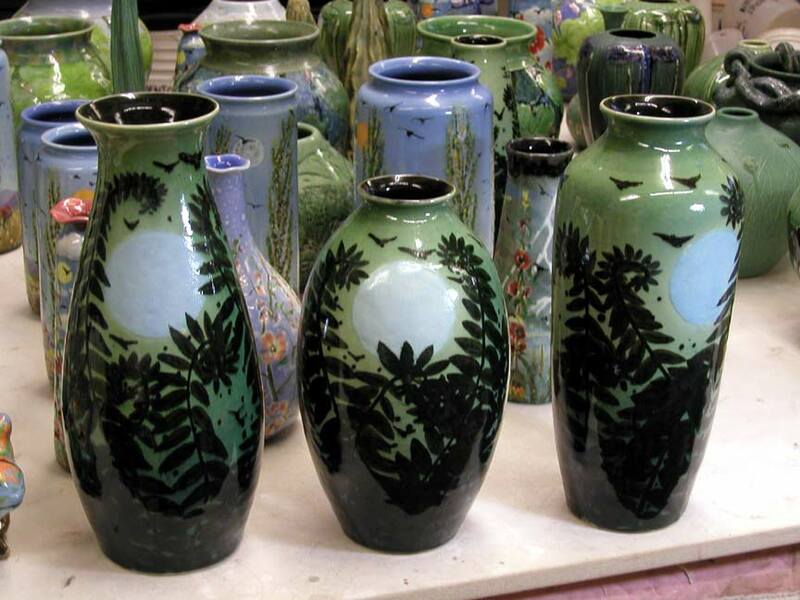 Tim Fredrickson always bys a couple of the best pots. And I appreciate it!! 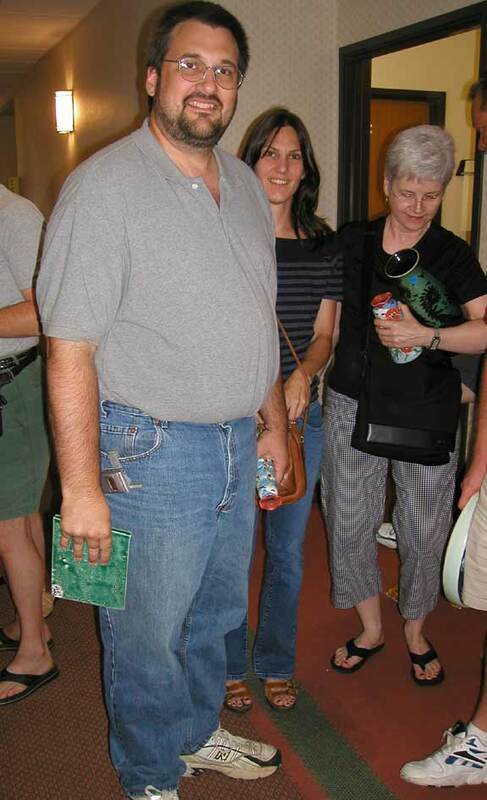 It is always a joy to see Terry and Sheri. And Paula, in the black, as well. She bought a piece last year and I was TICKLED to see her this year. Yes Paula, "tickled." Please bring a shopping bag along next year, Paula. Here are four of the VERY faithful. They literally support me. 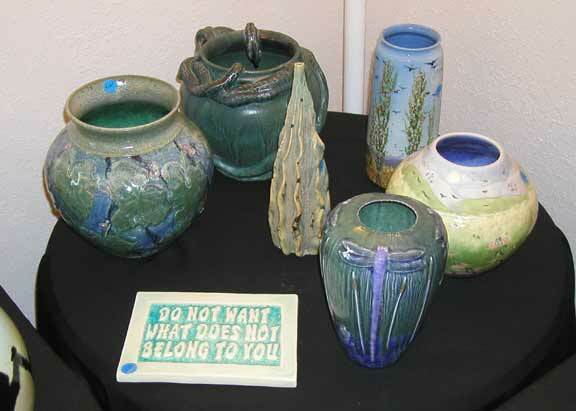 They probably don't think about it like that, but without them.... Terry in the blue (she got two of the frogs and my son's only pot), Robert with a primo pot and wife, Cheryl, fresh from picking indian corn. And Dave who you can barely see. Dave and wife, Mary, actually brought me some live plants for me to take back to St. Louis as a source of inspiration. By the way Mary, the plant is called "bee balm moderna" or something like that. Here again is Art and Kate. Walk in their room at 11 pm and you better be ready to eat. And talk. And drink. And just have fun. One of Kate's killer pots. 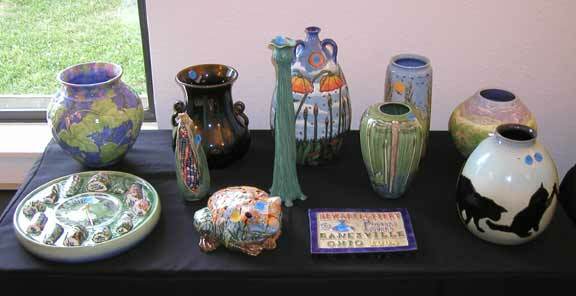 And a shelf or two of Art's "introductory Zanesville pots." 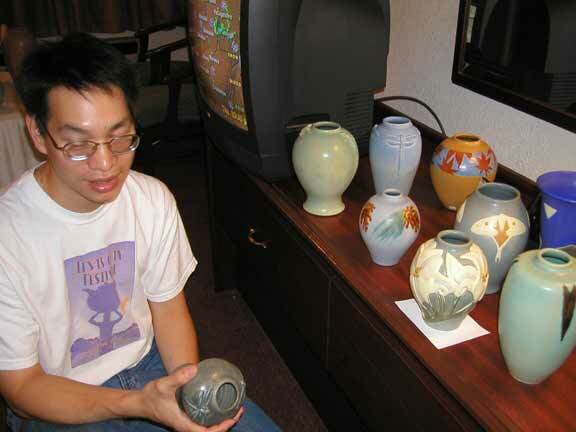 Look at his pot's surfaces and you will find yourself getting lost. Or in my case, inspired. I am going to steal from you Art. And Jim Soffer. If I could describe him, I would. But words fail me. If you knew him, you would know why. Love ya, Jimmie. 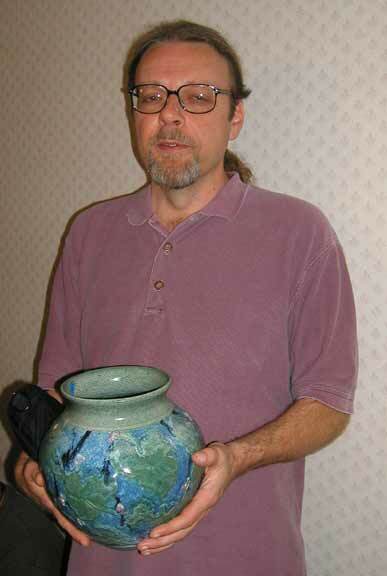 Tim Miller got the pot of his dreams. He literally caught me driving off the motel parking lot to head home and we did a deal for this pot. I am glad he got it. It is obviously love. 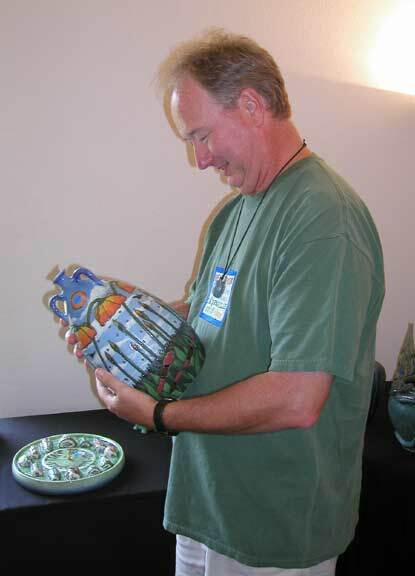 This is Larry Swaney with a wonderful Conant Rookwood piece. 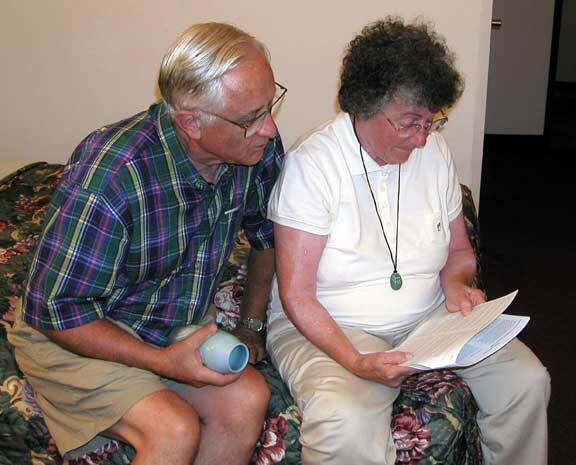 Larry and wife, Mary, pouring over an auction catalogue. Three ladies, (sorry about the hand in the face Stef,) home from a long day at the auction. Russell with a great one. 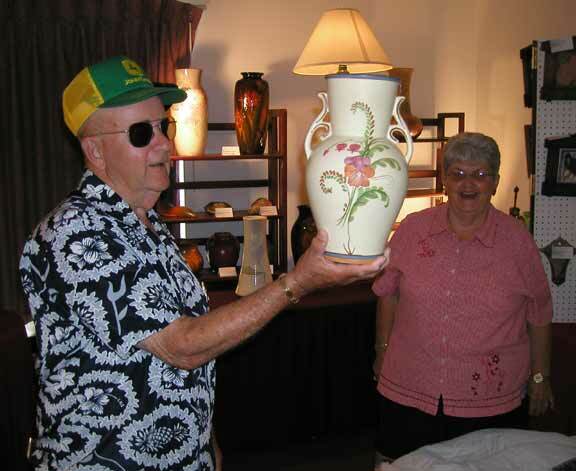 And I am not talking about the pot, JoAnn. 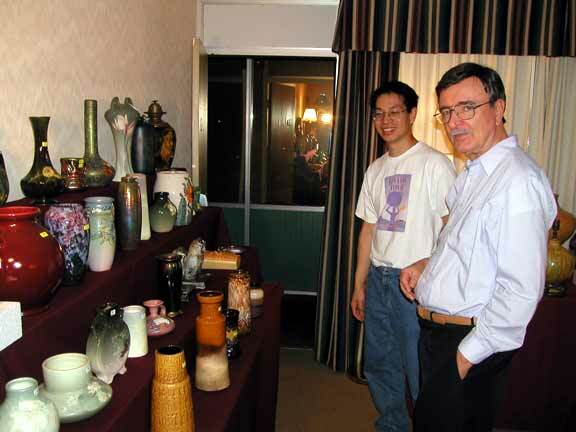 Len and Terry Senior are kind and supportative enough to set up a little newartpottery shrine in their room. The cat pot is my son's. 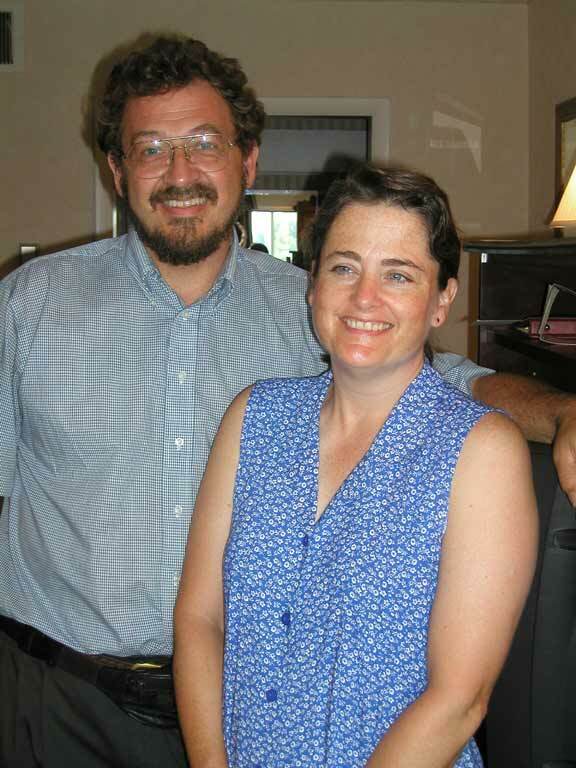 This is John and Scottie from Hog Hill Pottery in Vale, NC. Scottie made one of the most amazing pieces of the whole show. But I didn't take a picture of it!!!! My apologies. But I did buy a plate. And I love it. 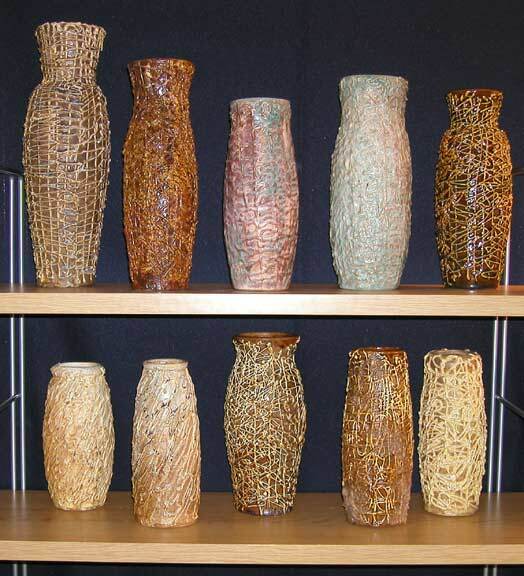 A picture of Chris Powell who makes beautiful and precise pots. No web site but he will shortly. 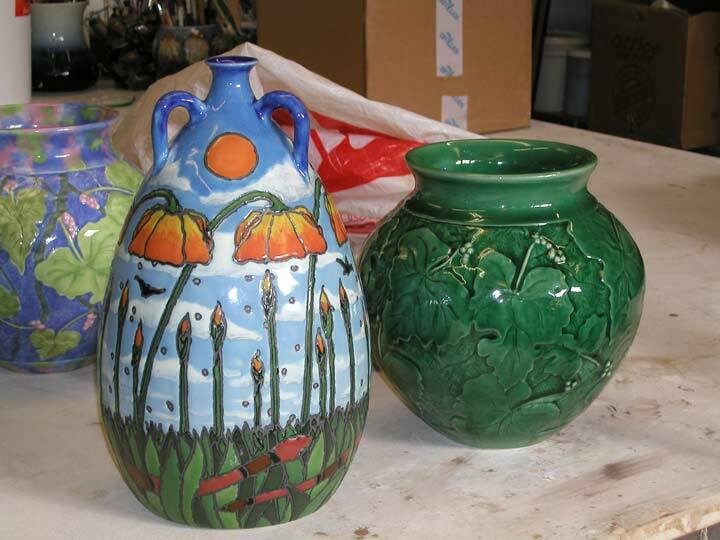 Two of the last pots to come out of the kiln before the show. 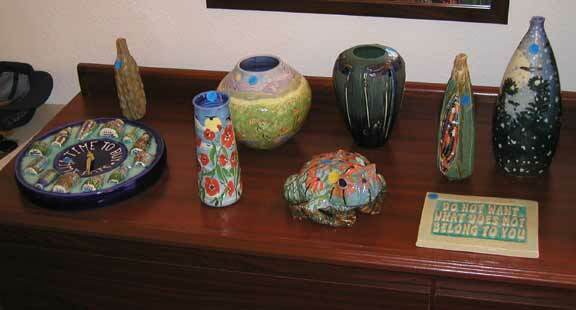 And a group shot of some of my pots Zanesville bound. 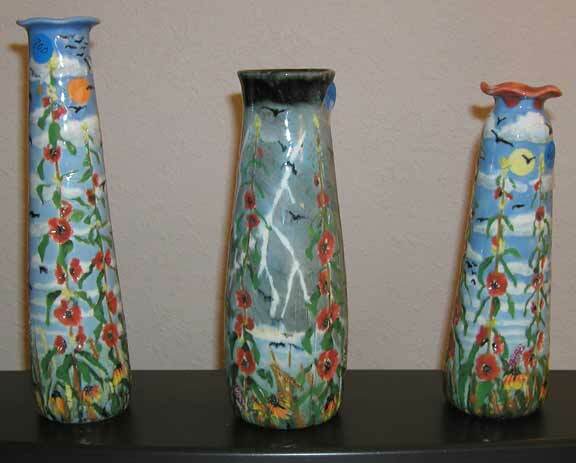 If you are new to this site and don't know what Pottery Lovers is, check out the Pottery Lovers web site. And then check out my "report" from last years gathering. If will give you more of a feel of what it is like. Sorry I didn't take more picture.